A catechism (κατηχητικός in Greek) is a summary or exposition of doctrine, traditionally used in Christian religious teaching. Catechisms are doctrinal manuals often in the form of questions followed by answers to be memorized, a format that has sometimes been used in non-religious or secular contexts as well. Primarily intended as instruction to clergy, teachers and parents, catechisms have been valuable repositories of Christian faith over the ages, containing great wisdom in concise format. Borrowed from the Greek, the term catechesis (meaning "to make resound, as with an echo") originally denoted oral transmission from teacher to student, or instruction by dialogue. As with many things in Christian custom, the practice of catechizing was adapted from a similar style of instruction in the Jewish synagogues and Rabbinical schools. The Rabbis had the dialogical method, and the Greeks had the Socratic method, both of which informed Christian catechesis. However, unlike both of these precursor influences, the Christian emphasis was from the beginning to pass on articles of faith, or definitions of belief. Christian tradition holds that catechetical schools were established almost immediately by the apostles themselves. One of the most important of these schools was said to have been established by Mark the Evangelist, in Alexandria, Egypt. Eusebius' Ecclesiastic History, states that Mark came to Egypt during the first or third year of the Roman Emperor Claudius, and evangelized in Alexandria, between 61 and 68 C.E. Alexandria was also the school of theology where Clement and Origen were teachers. Some modern scholarship favors the theory that the four written Gospels of the New Testament were products of Catechetical schools founded by the apostles or disciples of the apostles. The Didache (c. 70–160 C.E.) is possibly the first written catechism. Through schools such as this, summaries of doctrine were produced with a view to carefully and methodically handing down the teachings of the Church. As a summary of what must be believed, the Nicene creed was taught in the Greek churches, and the Apostles' Creed was dominant in the Latin churches; the Lord's Prayer was taught as the model of how to pray; and, the Ten Commandments were the summary of how to live. At various times and places, special chapters were added to the manuals, for instruction on the sacraments, the Athanasian Creed, the Te Deum, and other elements of the Liturgy. Lists of sins and virtues also became a common part of catechesis, in the monasteries and the churches. In the case of adult converts, this instruction preceded baptism; in the case of baptized infants, it followed baptism, and in the West culminated in their confirmation and the first communion. Baptized infants in the East were also chrismated (confirmed) almost immediately after baptism, and shortly after began receiving communion; catechism came later, often during the teenage years. Cyril of Jerusalem (c. 315- c. 386 C.E.) left 16 books of instructional sermons, explaining the Creed to families seeking baptism, which became standard in the Greek speaking churches. The same Cyril also had five books of instruction attributed to him, concerning the sacraments of Baptism, Confirmation in the Christian Faith, and Eucharist, for the benefit of those who had recently received one of these sacraments. In the Latin churches, St Augustine's (354-430 C.E.) treatise on catechizing (De catechizandis rudibus), written for teachers, came to dominate, together with his work on the basics of doctrine and prayer (Enchiridion). After the Edict of Milan (313 C.E. ), which allowed freedom of belief, catechesis became an increasingly greater challenge that sometimes fell into neglect, especially in the frontiers of the Roman and Byzantine Empires. 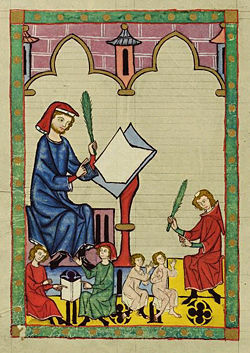 In 829 C.E., a council in Paris records the bishops' alarm over the neglect of catechetical instruction. Very simple instructional manuals survive, from the St. Gall monks Kero (720) and Notker Balbulus (912), and Otfrid of Weissenburg (870). Gerson's tract, De Parvulis ad Christum trahendis, gives another picture of what late medieval instruction was like. In 1281 the English Council of Lambeth made it a canonical rule of Church practice, for parish priests to instruct their people four times a year in the principal parts of Christian doctrine. The best-known modern catechisms of the Orthodox and Catholic traditions are not meant to be memorized. Rather, they are massive compendia of detailed explanations of doctrine. The Jerusalem Catechism of Orthodoxy is a work primarily designed for refutation of error—in the tradition of Irenaeus's Against Heresies. There are many Orthodox catechisms without obvious official authority, some of which appear to be designed for the instruction of converts especially from Protestantism. The Orthodox Faith is a four volume series that sets forth the basics of Orthodoxy. It is written by Father Thomas Hopko, dean of St. Vladimir's Seminary (Orthodox Church in America). Catechesis is an elementary form of religious instruction, typically oral, and traditionally under the guidance of a parent, pastor or priest, religious teacher, or other individuals in church roles (including a deacon, religious monk or nun) who poses set questions and prompts students (or disciples) toward understanding the answers given. Catechetics is the practice of this kind of instruction, or the study of it, including training in such instruction. A catechist is one who engages in such religious instruction. 1. Q. Who made the world? 2. Q. Who is God? heaven and earth, and of all things. 3. Q. What is man? image and likeness of God. The Catechism of the Catholic Church is the current catechism most widespread use among Catholics today. It is the official Catechism of the Church. The Roman Catechism was first published in 1566 under the authority of the Council of Trent. It is unusual in that it was written as a guide for priests rather than for instruction of children or neophytes. Various editions of the Baltimore Catechism were the de facto standard Catholic school text in America from 1885 to the 1960s. The Catechism of the Catholic Church is a work of remarkable organization and breadth, containing articles of elegant reasoning and historical insight, arranged on the classical topics, but it is not a work adapted to the capacity of the untaught, and it is not in a question and answer format. The catechism's question-and-answer format, with a view toward the instruction of children, was a form adopted by Protestant Christians almost from the beginning of the Reformation. Among the first projects of the Protestant Reformation, was the production of catechisms self-consciously modelled after the older traditions of Cyril and Augustine. These catechisms showed special admiration for John Chrysostom's view of the family as a "little church," and placed strong responsibility on every father to teach his children, in order to prevent them from coming to Baptism or the Lord's Table ignorant of the doctrine under which they are expected to live as Christians. Therefore it is the duty of every father of a family to question and examine his children and servants at least once a week and to ascertain what they know of it, or are learning and, if they do not know it, to keep them faithfully at it. You must not have other gods. A. We must fear, love, and trust God more than anything. Calvin produced a catechism while at Geneva (1541), which underwent two major revisions (1545 and 1560). Calvin's aim in writing the Catechism of 1545 was to set a basic pattern of doctrine, meant to be imitated by other catechists, which would not affirm local distinctions or dwell on controversial issues, but would serve as a pattern for what was expected to be taught by Christian fathers and other teachers of children in the Church. The catechism is organized on the topics of faith, law, prayer and sacraments. 1. Master. What is the chief end of human life? Scholar. To know God by whom men were created. 2. M. What reason have you for saying so? should be devoted to his glory. 3. M. What is the highest good of man? When Frederick III came into power in 1559, he called upon Zacharias Ursinus and his colleague Caspar Olevianus to produce a catechism. The two collaborators referred to existing catechetical literature, and especially relied on the catechisms of Calvin and of John Lasco. To prepare the catechism, they adopted the method of sketching drafts independently, and then bringing together the work to combine their efforts. "The final preparation was the work of both theologians, with the constant co-operation of Frederick III. Ursinus has always been regarded as the principal author, as he was afterwards the chief defender and interpreter of the catechism; still, it would appear that the nervous German style, the division into three parts (as distinguished from the five parts in the Catechism of Calvin and the previous draft of Ursinus), and the genial warmth and unction of the whole work, are chiefly due to Olevianus." (Schaff, in. Am. Presb. Rev. July 1863, 379). The structure of the Heidelberg Catechism is spelled out in the second question, and the three-part structure seen there is based on the belief that the single work of salvation brings forward the three persons of the Trinity in turn, to make God fully and intimately known by his work of salvation, referring back to the Apostles' Creed as an epitome of Christian faith. Assurance of salvation is the unifying theme throughout this catechism: assurance obtained by the work of Christ, applied through the sacraments, and resulting in grateful obedience to the commandments and persistence in prayer. 1. Q. What is thy only comfort in life and death? mayest live and die happily? my gratitude to God for such deliverance. Together with the Westminster Confession of Faith (1647), the Westminster Assembly also produced two catechisms, a Larger and a Shorter, which were intended for use in Christian families and in churches. These documents have served as the doctrinal standards, subordinate to the Bible, for Presbyterians and other Reformed churches around the world. The Shorter Catechism shows the Assembly's reliance upon the previous work of Calvin, Lasco, and the theologians of Heidelberg. It is organized in two main sections summarizing what the Scriptures principally teach: the doctrine of God, and the duty required of men. Questions and answers cover the usual elements: faith, the Ten Commandments, the sacraments, and prayer. how we may glorify and enjoy him. what duty God requires of man. Oecolampadius composed the Basel Catechism in 1526, followed by Leo Juda (1534) and Bullinger (1555) who published catechisms in Zurich. The French Reformed used Calvin's Genevan Catechism, as well as works published by Louis Capell (1619), and Charles Drelincourt (1642). The Anglican Book of Common Prayer includes a brief catechism for the instruction of all persons preparing to be brought before the bishop for Confirmation. The baptized first professes his baptism, and then rehearses the principal elements of the faith into which he has been baptized: Apostles' Creed, Ten Commandments, the Lord's Prayer, and the sacraments. C. Who gave you this Name? and an inheritor of the kingdom of heaven. Besides the manuals of instruction that were published by the Protestants for use in their families and churches, there were other works produced by sectarian groups intended as a compact refutation of "orthodoxy." For example, Socinians in Poland published the Rakow Catechism in 1605, using the question and answer format of a catechism for the orderly presentation of their arguments against the Trinity and the doctrine of Hell, as these were understood by the Reformed churches from which they were forced to separate. This work spread rapidly, despite efforts to censor it, and has inspired many imitators even to the present time. Baptist affiliations of congregations have at times adopted the Reformed catechisms, modified to reflect Baptist convictions, especially concerning the nature of the church and the ordinances of baptism and communion. The Anabaptists have also produced catechisms of their own, to explain and defend their distinctives. The Hindu Upanishads are a collection of sacred texts that contain dialogues (questions and answers) between teachers and disciples which were originally memorized, handed down orally, and served as a form of religious instruction. Hinduism continues to employ a dialogical format of religious instruction to transmit its teachings, which is epitomized in the guru-disciple relationship. Although Hinduism does not have a pan-Hindu catechism per se, due to the intrinsic diversity of the religion, many modern attempts have been made to introduce Catechisms in the religion without much success. This may be due in part to the fact that Hindus do not have a unifying religious authority figure or ecclesiastic structure. Judaism does not have a formal catechism as such, but it has a flourishing Rabinnical tradition of scholarly midrash as seen in the Talmud and various Law Codes. Such writings elucidate Jewish principles of faith that religious Jews are expected to follow. Many other religions use forms of instruction that resemble Christian catechisms though few have appropriated this specific term for themselves. Baltimore Catechism No. 1, available for free via Project Gutenberg. An abridged edition for younger students. Baltimore Catechism No. 2, available for free via Project Gutenberg. The main edition. Baltimore Catechism No. 3, available for free via Project Gutenberg. An expanded edition for older students. Baltimore Catechism No. 4, available for free via Project Gutenberg. An annotated edition for teachers. This page was last modified on 18 January 2017, at 15:39.